Put more files in the same space or the same files in less space. Cost reduction can be significant when workstation filing and storage are centralized in the File Harbor Cabinets. 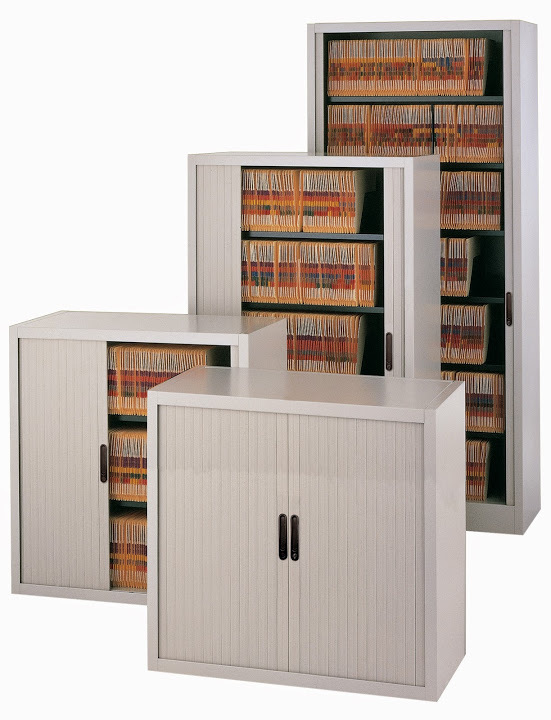 These file cabinets feature unique horizontally-receding tambour doors which simply glide into the sides of the file cabinet, and with no drawers or doors protruding into the workstation, expensive floor space can be saved. Space planners gain about five square feet each time a File Harbor Cabinet replaces a 42" wide lateral file. Cabinets are preconfigured for color-coded end-tab filing, and include shelves with adjustable shelf dividers. Available in Pebble Gray. Put more files in the same space or the same files in less space. Cost reduction can be significant when workstation filing and storage are centralized in the File Harbor Cabinets. These cabinets feature unique horizontally-receding tambour doors which simply glide into the sides of the cabinet, and with no drawers or doors protruding into the workstation, expensive floor space can be saved. Space planners gain about five square feet each time a File Harbor Cabinet replaces a 42" wide lateral file. Put more files in the same space or the same files in less space. Cost reduction can be significant when workstation filing and storage are centralized in the File Harbor Cabinets. These cabinets feature unique horizontally-receding tambour doors which simply glide into the sides of the cabinet, and with no drawers or doors protruding into the workstation, expensive floor space can be saved. Space planners gain about five square feet each time a File Harbor Cabinet replaces a 42" wide lateral file. VQV Discount Office Furniture Put more files in the same space or the same files in less space. Cost reduction can be significant when workstation filing and storage are centralized in the File Harbor Cabinets. These cabinets feature unique horizontally-receding tambour doors which simply glide into the sides of the cabinet, and with no drawers or doors protruding into the workstation, expensive floor space can be saved. Space planners gain about five square feet each time a File Harbor Cabinet replaces a 42" wide lateral file. Put more files in the same space or the same files in less space. Cost reduction can be significant when workstation filing and storage are centralized in the File Harbor Cabinets. These cabinets feature unique horizontally-receding tambour doors which simply glide into the sides of the cabinet, and with no drawers or doors protruding into the workstation, expensive floor space can be saved. Space planners gain about five square feet each time a File Harbor Cabinet replaces a 42" wide lateral file. The File Harbor cabinet is the most unique and universal cabinet on the market, solving your storage problems once and for all. The key to the File Harbor's appearance, security and function is the locking tambour door. When opened, the entire contents are fully exposed and easily accessed. Significant cost reductions can be achieved when File Harbor cabinets are utilized in individual workstations, providing privacy between users and flexible, high density storage. The File Harbor cabinet is the most unique and universal cabinet on the market, solving your storage problems once and for all. The key to the File Harbor's appearance, security and function is the locking tambour door. When opened, the entire contents are fully exposed and easily accessed. Significant cost reductions can be achieved when File Harbor cabinets are utilized in individual workstations, providing privacy between users and flexible, high density storage. The File Harbor cabinet is the most unique and universal cabinet on the market, solving your storage problems once and for all. The key to the File Harbor's appearance, security and function is the locking tambour door. When opened, the entire contents are fully exposed and easily accessed. Significant cost reductions can be achieved when File Harbor cabinets are utilized in individual workstations, providing privacy between users and flexible, high density storage. The File Harbor cabinet is the most unique and universal cabinet on the market, solving your storage problems once and for all. The key to the File Harbor's appearance, security and function is the locking tambour door. When opened, the entire contents are fully exposed and easily accessed. Significant cost reductions can be achieved when File Harbor cabinets are utilized in individual workstations, providing privacy between users and flexible, high density storage. Put more files in the same space or the same files in less space. Cost reduction can be significant when workstation filing and storage are centralized in the File Harbor Cabinets. These cabinets feature unique horizontally-receding tambour doors which simply glide into the sides of the cabinet, and with no drawers or doors protruding into the workstation, expensive floor space can be saved. Space planners gain about five square feet each time a File Harbor Cabinet replaces a 42" wide lateral file. Mayline File Harbor Cabinets on Kwik-Track - 2/1 System 78"W x 38 1/2"D x 85"H LFI 651"
Mayline File Harbor Cabinets on Kwik-Track - 2/1 System 90"W x 38 1/2"D x 85"H LFI 777"
Mayline File Harbor Cabinets on Kwik-Track - 2/1 System 99"W x 38 1/2"D x 85"H LFI 882"
Mayline File Harbor Cabinets on Kwik-Track - 2/1/1 System 78"W x 59 1/4"D x 85"H LFI 868"
Mayline File Harbor Cabinets on Kwik-Track - 2/1/1 System 90"W x 59 1/4"D x 85"H LFI 1036"
Mayline File Harbor Cabinets on Kwik-Track - 3/2 System 116"W x 38 1/2"D x 85"H LFI 1085"
Mayline File Harbor Cabinets on Kwik-Track - 2/1/1 System 99"W x 59 1/4"D x 85"H LFI 1176"
Mayline File Harbor Cabinets on Kwik-Track - 3/2 System 137"W x 38 1/2"D x 85"H LFI 1295"
Mayline File Harbor Cabinets on Kwik-Track - 3/2 System 150"W x 38 1/2"D x 85"H LFI 1470"
Mayline File Harbor Cabinets on Kwik-Track - 4/3 System 156"W x 38 1/2"D x 85"H LFI 1519"
Mayline File Harbor Cabinets on Kwik-Track - 3/2/2 System 116"W x 59 1/4"D x 85"H LFI 1519"
Mayline File Harbor Cabinets on Kwik-Track - 4/3 System 180"W x 38 1/2"D x 85"H LFI 1813"
Mayline File Harbor Cabinets on Kwik-Track - 3/2/2 System 137"W x 59 1/4"D x 85"H LFI 1813"
Mayline File Harbor Cabinets on Kwik-Track - 4/3 System 198"W x 38 1/2"D x 85"H LFI 2058"
Mayline File Harbor Cabinets on Kwik-Track - 3/2/2 System 150"W x 59 1/4"D x 85"H LFI 2058"
Mayline File Harbor Cabinets on Kwik-Track - 4/3/3 System 156"W x 59 1/4"D x 85"H LFI 2170"
Mayline File Harbor Cabinets on Kwik-Track - 4/3/3 System 180"W x 59 1/4"D x 85"H LFI 2590"
Mayline File Harbor Cabinets on Kwik-Track - 4/3/3 System 198"W x 59 1/4"D x 85"H LFI 2940"
Put more files in the same space or the same files in less space. Cost reduction can be significant when workstation filing and storage are centralized in the File Harbor Cabinets. These cabinets feature unique horizontally-receding tambour doors which simply glide into the sides of the cabinet, and with no drawers or doors protruding into the workstation, expensive floor space can be saved. Space planners gain about five square feet each time a File Harbor Cabinet replaces a 42" wide lateral file.